It would be must-see TV for space geeks everywhere — two big-name scientists debating whether or not Pluto should be reinstated as the solar system's ninth "true" planet. Alan Stern, the principal investigator of NASA's New Horizons mission to Pluto, has challenged astrophysicist Neil deGrasse Tyson to just such a debate, NBCNews reported last week. "I am challenging him to the equivalent of the 'Thrilla in Manila,'" Stern told NBCNews. "Before New Horizons gets to Pluto, I want him to accept the debate." That gives Tyson — the host of "Cosmos: A Spacetime Odyssey," a TV series that aired this spring on Fox and the National Geographic Channel — about a year to work the proposed debate into his schedule, if he so chooses. 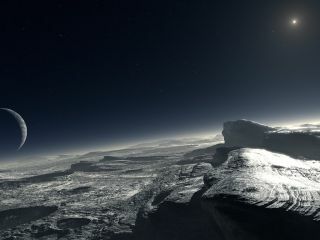 New Horizons is scheduled to fly by the Pluto system in July 2015, giving astronomers their first-ever up-close look at the frigid world and its five known moons. So Pluto was demoted to the newly created category of "dwarf planet," a status it shares with several other large bodies in the frigid, faraway Kuiper Belt. Some scientists, such as Tyson, have expressed support for the decision, while others are not at all happy about it. Stern is perhaps the most prominent and passionate of the dissenters. He has no problem with the "dwarf planet" designation but believes that dwarfs should enjoy the same status as rocky worlds like Earth and gas giants such as Jupiter.